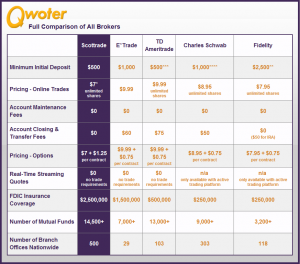 Here’s a clear picture of what Scottrade does – Scottrade is an online discount brokerage company that deals with instruments such as IRAs, Mutual Funds, Stocks, Bonds, and all other securities that can be traded online. This company is perfect for beginners as well as experienced investors in the market. One of the unique features of Scottrade is that the company does not charge any maintenance fee. This means that even if your account is inactive for weeks or months, you will not have to worry about the fees stacking up unlike most of the other online brokerage companies and IRA providers. There are also three types of accounts that you can choose from Scottrade – Scottrade.com, scottrader and also ScottradeElite. To get the account started and running on Scottrade it would take just about 10 minutes. All that you would have to do is to provide your basic details and then you’re set to use the system. IRAs are among the major products that are offered by Scottrade. There are four types of IRAs – the Traditional IRA, the Roth IRA, the Rollover IRA, and the SEP IRA. The traditional IRA is an investment option for retirement in which the contributions to the account are tax-deductible. In these accounts, there is no minimum annual contribution. Although the contributions are not taxable in the traditional IRA, the distributions will be taxable in the hands of the individual. Distributions and withdrawals are generally allowed after a person reaches the age of 59 ½ years. However, if any withdrawals are made before this time, the amount may be subject to penalty tax. Also, after a person reaches the age of 70 ½ years, distributions become mandatory. It is to be noted that all the distributions and withdrawals are taxable. The Scottrade contribution limit for these funds is $5,000 per annum and the additional catch up contribution limit for individuals aged over 50 is $1,000. With the Roth IRA, the primary difference from the Traditional IRA is that the contributions to the Roth IRA account are made after payment of tax. This means that when the time for the withdrawal comes, the amount will be totally tax-free. In most cases, the Roth IRA is more beneficial than the Traditional IRA if tax is not a problem for the individual. The contribution limits as per the Scottrade account are similar to the limits that are imposed on the Traditional IRA accounts. As the title suggests, this type of account is useful for individuals who would like to transfer the funds from a previous IRA account or a 401k account or any other qualified account in order to save on taxes and penalties. This also ensures that the investments grow tax deferred. The funds from other retirement accounts such as 401k or other IRAs can generally be transferred to the traditional IRA or the Roth IRA. After the transfer, the rules of the traditional or the Roth IRA will apply to the account. SEP IRA refers to the Simplified employee pension IRA. These accounts are generally set up by the business owners to the employees. As these funds are treated as IRAs, the treatment and the rules regarding the SEP IRA are similar to the treatment of the funds in the traditional IRA. To be eligible for the SEP IRA, the person must be at least 21 years of age, the individual must have worked for the employer for at least 3 years in the past 5 years and the employee must have received at least $500 compensation for the tax. To get your Scottrade IRA account, all that is required is a minimum deposit of $500 with the completed application. Once the account is set up, there is virtually no maintenance fee that will be charged on the account, even if it is dormant. The only other fee that will be charged on the account is the trading fees. The fee amount for trading on Scottrade is $7 per transaction, irrespective of the amount of the transaction and the frequency of transaction. In other words, you will not have to pay a huge commission on huge transactions. For the market limit orders, there is an additional fee of $1.25 per contract. These charges are relatively very less when compared to the other online brokers. Low set up fees – only $500 is required to open an account with Scottrade. By far, this is the lowest opening fee that is charged by any company. Low fees for transactions – the transaction fee is just $7 per transaction. This is much cheaper than the fee that is charged by the competitors such as Etrade. Also, there is no maintenance fees charged on the account. This means that even if you have forgotten about the account, you will not have to worry about having to pay a huge fee when you return to Scottrade. Most other companies charge a maintenance fee and this fee keeps building up over time. Also, there is no charge applied if an individual wants to close an account. There are many investment options available at Scottrade – the IRAs are the primary investment options that are offered by Scottrade but there are also other investment options like mutual funds, stocks, bonds, certificated of deposits, and even other retirement accounts. As far as the mutual fund options are concerned, this company has over 2800 different typed of mutual fund options available. That is considerably a lot more than the fund options available at other companies. Although there are no major disadvantages with the use of Scottrade, one of the disadvantages seems to be the lack of a dividend reinvestment plan. In most cases, these plans reduce the cost to an individual with respect to reinvesting earnings. With Scottrade, every time an individual reinvests the earnings, a fee of $7 will be incurred. This means that if a person has to reinvest the earnings every quarter, then the fees that would be applicable is $28 per annum. Apart from this small disadvantage, there does not seem to be any other apparent disadvantage with the use of Scottrade. 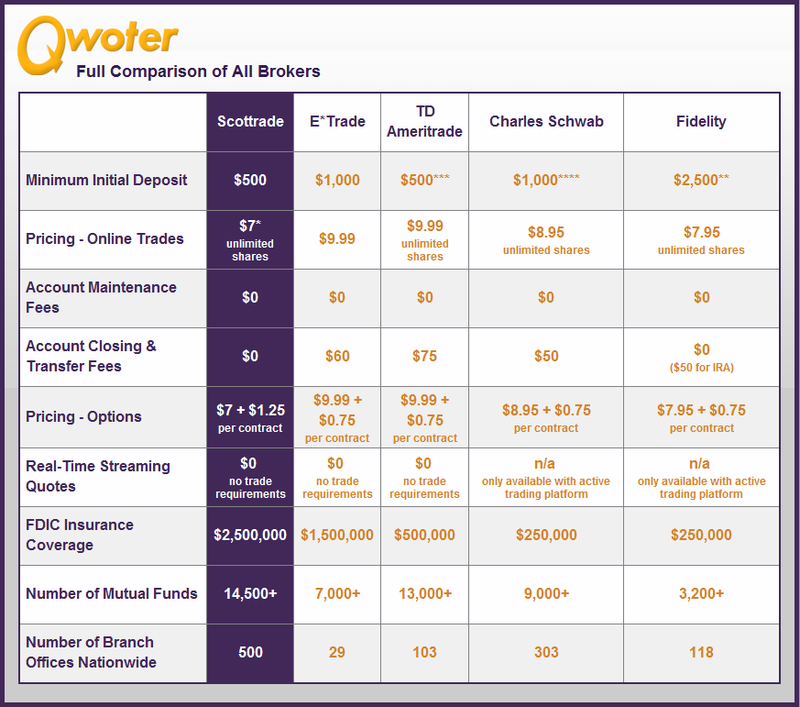 Scottrade is one of the best options available for an online trading broker. With the low maintenance fee and the low-cost of opening an account, this is certainly a very good option for any beginner considering online trading. Scottrade surpasses the service that is offered by most of its competitors. The only negative aspect about the company is the lack of a dividend reinvestment plan. The best part about Scottrade is that you can close your account with no hassles and there is no cost involved with closing an account either! Open your Scottrade IRA today!